Born 23rd June 1984, daughter of Donald and Anne Marie Spencer, she attended Entrepot Secondary School, followed by Sir Arthur Lewis Community College and then to Albany State University where she majored and graduated in Computer Sciences. Spencer was an All-American high jumper for the University of Georgia and 2008 Olympian for St Lucia, set a new facility record at the Georgia Invitational in Athens, Georgia on Saturday 8 May 2010, clearing 1.98m to cruise to a victory with what was at the time the second-best jump in the world for the 2010 season. This is the current St Lucia National Record and the record for the Caribbean Community. Her previous best jump was 1.95 metres, a height she achieved with a second-place finish at the ‘Gran Premio Gobierno de Aragón’ held on Saturday 18 July 2009 in Zaragoza, Spain and prior to that a height of 1.94 metres was first achieved in July 2005 at the Central American and Caribbean Games in Nassau and again at the IAAF World Championships in Athletics in Osaka in 2007. Levern enjoyed a superb 2008 season, setting a new personal best and national record of 1.90m indoors at the Clemson Meeting in South Carolina before embarking on a series of victorious performances, winning in Blacksburg, twice in Athens (Georgia), Iowa and then twice in Central America, in Port-of-Spain in mid-May with a jump of 1.92m and then in Cali when winning the 2008 Central American and Caribbean Championships with a jump of 1.91m. Levern is a former CARIFTA champion, CAC Junior champion and NACAC (North, Central American and Caribbean Championships) champion. She holds the CARIFTA record of 1.88m and the NACAC Under-23 record of 1.92m for women’s High Jump. She has also competed in the Commonwealth Games, placing third in the 2010 edition with a height of 1.88m, and made her Summer Olympics debut in Athens at Beijing 2008. In 2009, Levern signed her first professional contract with Stellar Group, becoming the first high jumper on their roster. She repeated as Central American and Caribbean champion in Havana, Cuba and signed an endorsement deal with Caribbean telecommunications provider, LIME – Landline, Internet, Mobile and Entertainment. She is featured on the cover of the 2010 LIME Services Directory, over 75,000 copies of which were distributed this year. After taking the gold medal at the 2009 Central American and Caribbean Championships in Athletics, Spencer was the sole St Lucian to qualify for the IAAF World Championships in Athletics in Berlin, but she failed to make the final. She also narrowly missed out on making the cut for the season-ending 2009 IAAF World Athletics Final, finishing ninth in the world for women’s High Jump. 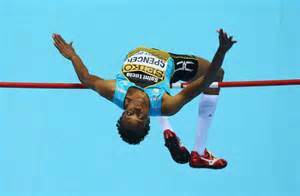 In 2010, with a best result of 1.98m, Levern was the leading women’s high jumper in the British Commonwealth. At the Games in India, however, she needed two attempts to clear 1.88m, and she eventually recorded St Lucia’s best-ever individual finish at Commonwealth Games athletics, joining Dominic Johnson, who took bronze in men’s Pole Vault in 2002 in Manchester. In 2010, Levern recorded six of the top ten best jumps of her career. She scored a victory at the 2010 CAC Games with a jump of 1.94 m and also had success on the European circuit, scoring five straight victories in Finland to scoop the 2010 Finnish Elite Games jackpot. 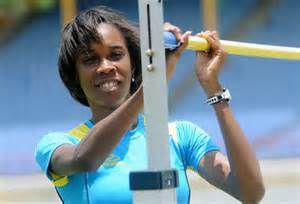 Levern is from the community of Babonneau, and has won multiple Sportswoman of the Year awards in St. Lucia.